From the Builders panel, you can specify which builders to enable for this project and in which order they are run. This list lets you select or deselect individual builders to run (by checking their boxes) and to define the order in which they are run. 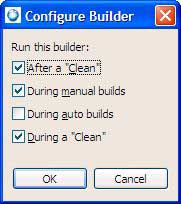 Opens the Choose configuration type dialog so that you can add a new builder to the list. 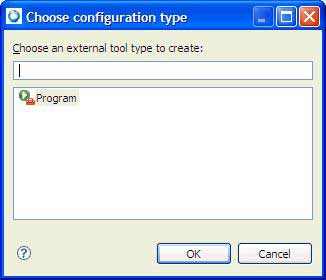 The Program option lets you to define an external tool for any executable file that is accessible on your local or network filesystem. For example, if instead of the Ant builder you prefer to use your own shell scripts or Windows .bat files to package and deploy your Eclipse projects, you can then create a Program external tool that would specify where and how to execute that script. Opens the Import launch configuration dialog so that you can import a builder to include it in the list. 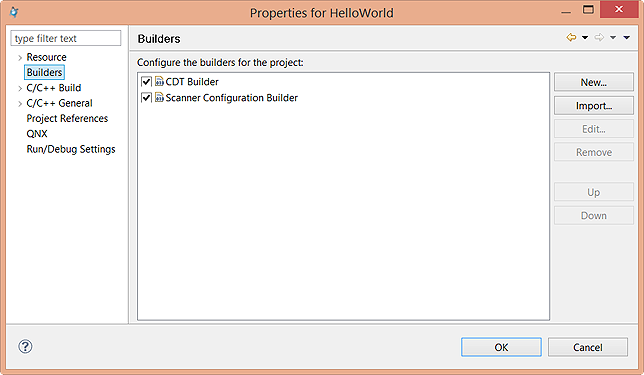 Opens the Configure Builder dialog that lets you specify when to run the selected builder. After a Clean — The builder is scheduled to run after a clean operation occurs. During manual builds — The build is initiated when you explicitly select a menu item or press its corresponding shortcut key sequence. During auto builds — Automatic builds are performed as resources are saved (they are incremental and operate over an entire workspace). Note that running your project builder during auto builds is possible, although it is not recommended because of performance concerns. During a Clean — The builder is scheduled to run during a clean operation. Removes the selected builder from the list. Moves the selected builder higher in the list to change the builder order. Moves the selected builder lower in the list to change the builder order.